Okay, Match-heads… this will be a little wibbly-wobbly timey-wimey as far as continuity… see I’ve been bringing you the recaps of Futures End on a monthly, four issue, basis which means the next batch you’ll get (12/03! Be there or be square!) 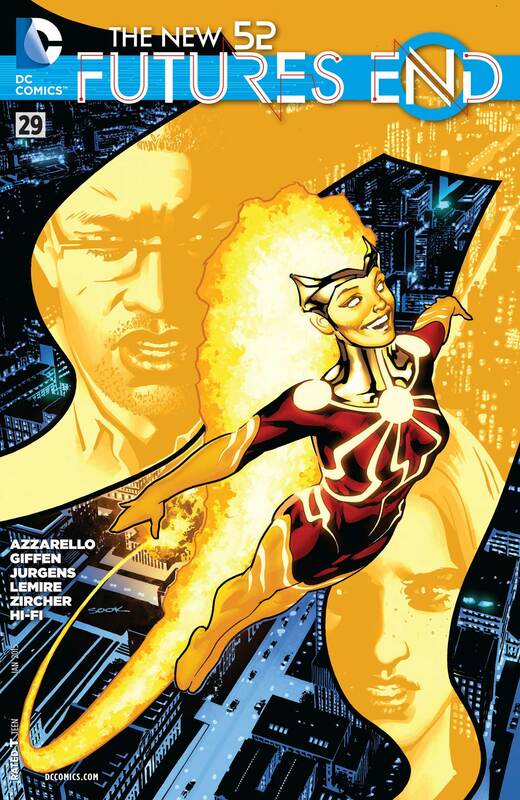 will cover issues #24-27… but issue #29 hit stores today and DAMN! This is worth delivering out of order! Seriously, if you are following the Futures End story line and haven’t read issue #29 yet, we strongly encourage you to avoid reading what follows. Five Years from now, in New York, Cal/Tim and Ronnie are battling their way through a swarm of Cadmus security guards in an attempt to get to into Columbia University. Ronnie seems impressed by Cal’s “crazy kung-fu”, which leads to Tim revealing himself by complimenting Ronnie’s ability to hold his own even “without your nuclear powers.” Someone has kidnapped Madison Payne and this dynamic duo is out to save her! At the same time Jason is inside, but being hassled by “the man”… well more Cadmus guards actually. He tries to explain that he’s a student, but they say Dr. Yamazake warned them he might try to interfere. Yamazake is moving ahead with his teleportation tests, which by the way Cadmus is funding. Jason knows this is bad news. He’s come to realize that Dr. Y is a little unstable and needs to be stopped, so he dodges past the guards and into the lab… just in time to see that Madison is about to become a Brundle-Fly! “Firestorm. 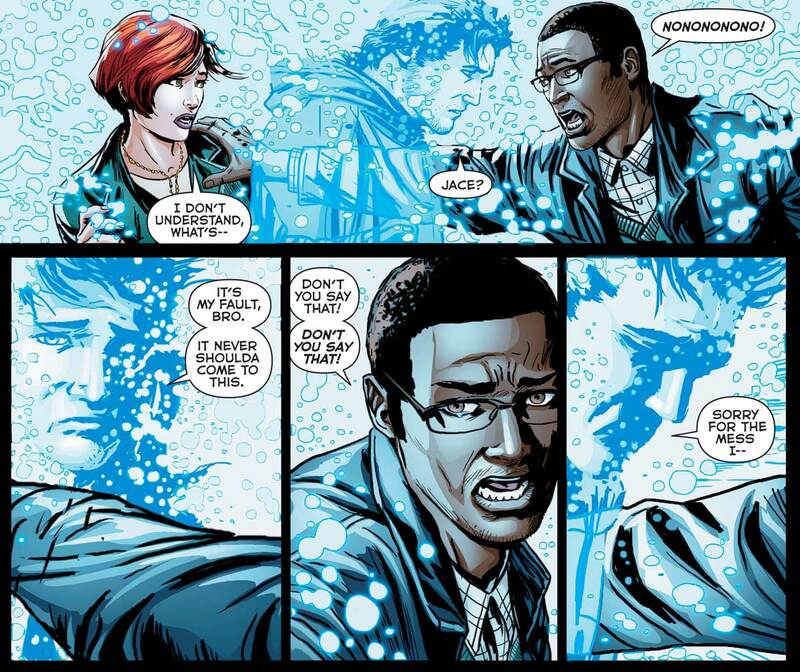 I feared you were going to show up.” Yes, with no regard for secret identities Dr. Yamazake exposes Jason. For his part Jason tries once again to point out some errors in the scientists equations, but gets a wrench to the back of the head for his trouble. Madison whines a little, that no one in her life has been honest with her… which, when you’re stuck in a tube about to be teleported by a mad scientist should really be the least of your worries, but maybe that’s just me. Outside Tim/Cal single-handedly holds back the Cadmus guards while Ronnie makes a run into the building, arriving in the lab just as Yamazake throws the switch! 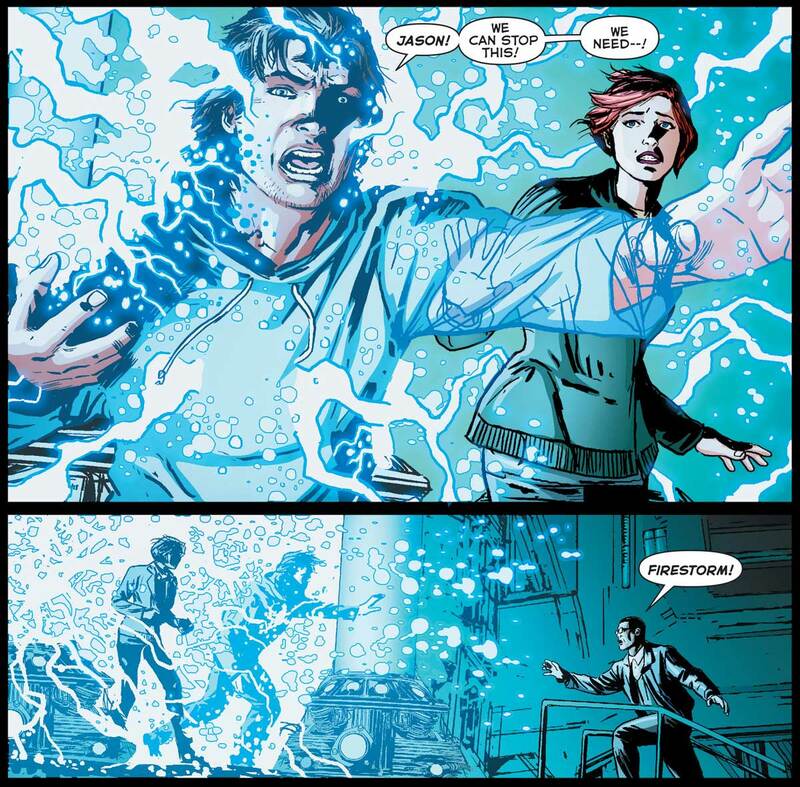 Ronnie shoves the scientist out of the way and runs to the teleporter, tearing the door open to release Madison. Caught in the teleportation matrix, Ronnie begins to dissolve. 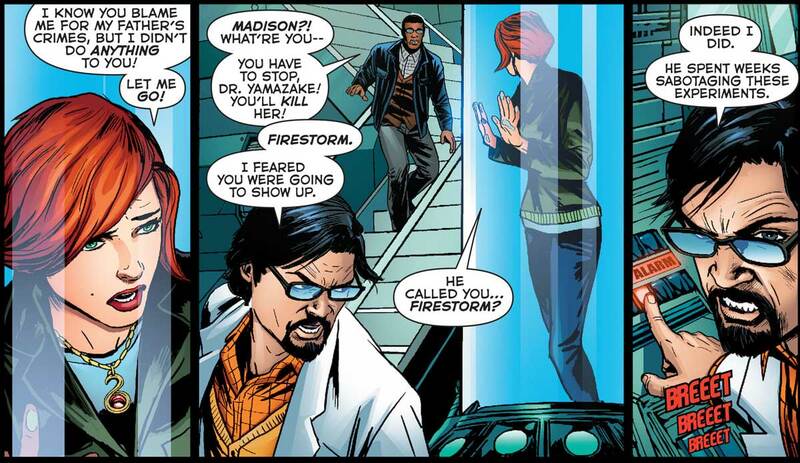 He calls to Jason… to fix this, they must become Firestorm! Reaching through Ronnie, Jason grabs Madison as the entire lab explodes around them…then, from the rubble bursts Firestorm! 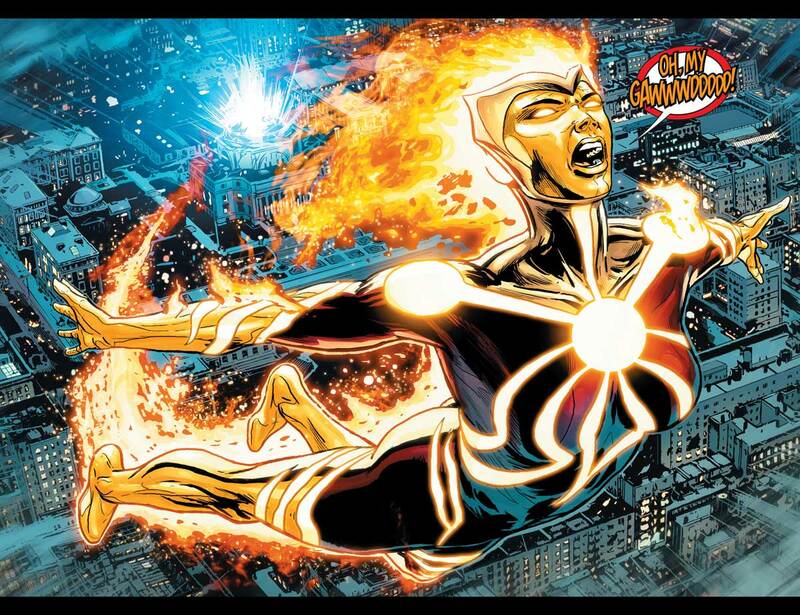 A female Firestorm! HOLY MACKEREL! That was an action-packed emotional rollercoaster of an issue… and obviously you can see why we couldn’t wait to share it! 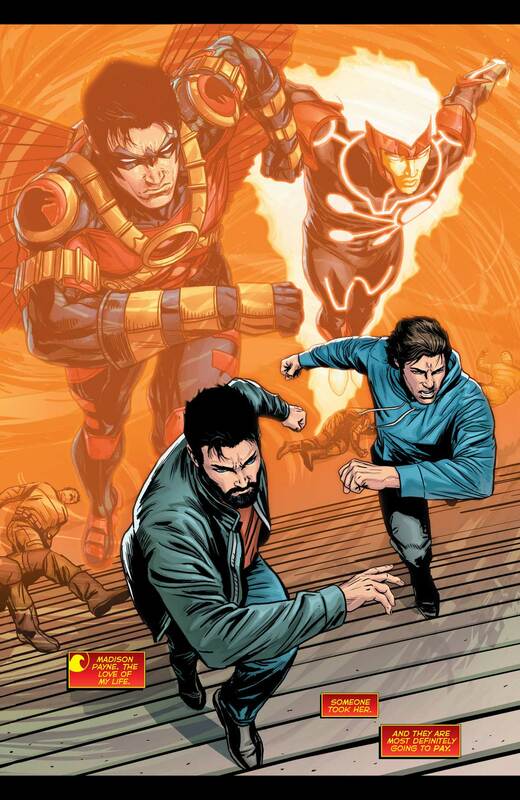 We got a reunion between Ronnie and Jason, Tim returning to action and (at least for now) ditching the “Cal” identity, and we have a new Firestorm! WOW! Shag here again! Wow is right, Tim!! Thanks for that coverage! What does this mean for the Nuclear Man… or Nuclear Woman… in present day?!?! We’ll have to wait and see! 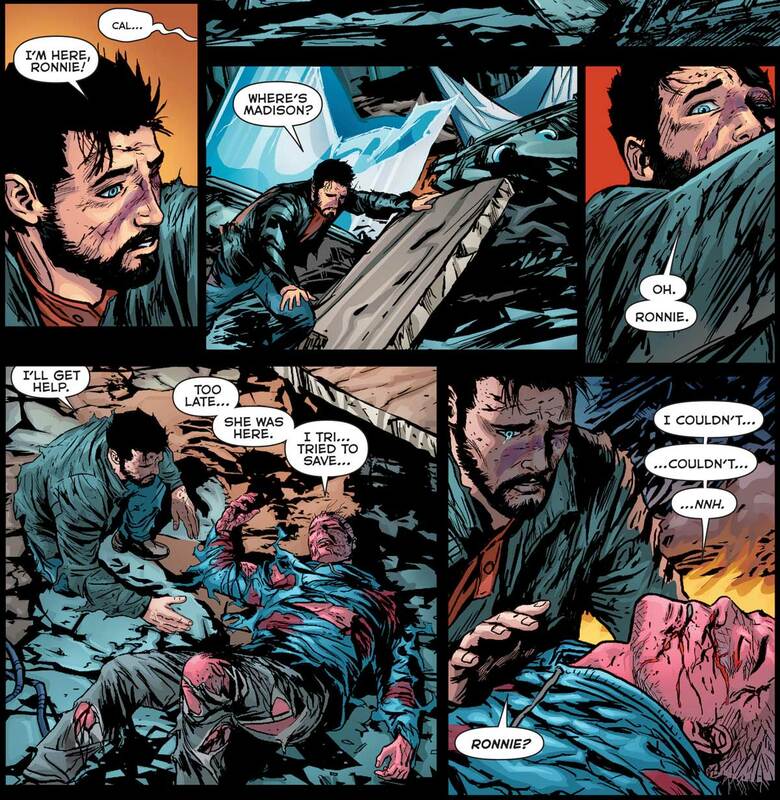 Tim will be back early next month with his regular coverage of, The New 52: Futures End! Let us know what you think of these developments! Be sure to follow Tim’s regular work over on his exceptional site, Kord Industries: A Blue Beetle Blog! Get all your Ted Kord, Jaime Reyes, and Dan Garrett goodness there! Get even more Tim-time over at the Legion of Super-Bloggers! You can also stalk Tim on Twitter, Facebook, and Google Plus. Posted in: Comic books, Dan Jurgens, Firestorm #10: New 52 v2 (Ronnie/Jason), Futures End, Jason Rusch, Madison Payne, Ronnie Raymond. ← Extra! Extra! Read All About It! Firestorm Joins JLA! I love the expression on her face on that Ryan Sook cover. It seems no one ever smiles anymore in modern comics New 52 (see interior art or the covers lining the walls of your LCS). To see someone clearly enjoying the sensation of flight (especially in the midst of the horrors that are FUTURES END) is soul restoring. Honestly, I find it difficult to care, as I remain convinced that most of what we’re seeing here will get hit by a giant “reset button” by the time it’s all over. But, as I’ve said in the past, I’ve found it difficult to like this New 52 version of Ronnie. So seeing him (at least partially) redeem himself in his final couple of “Future’s End” appearances, to be replaced by a potentially more interesting character (I’m already happier with New 52 Jason, but Madison is an enigma at present). If this *does* stick, I won’t be unhappy. Off topic, but I’m sure you caught the reference to the “burning guy” on this week’s Flash, or am I wrong?